Energy source tags can be used to mark your facility's points of control for energy sources. These tags help make the lockout process quicker, safer and easier. The energy source tags are made of polypropylene and available with colour coded and alphanumeric options. 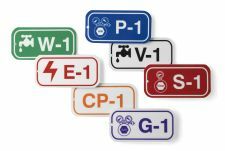 A variety of pre-printed energy source tags are available or they can be customised to meet your specific application.